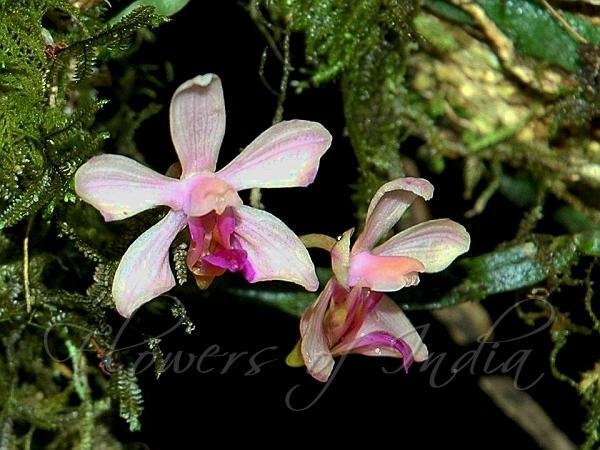 Bandage-Like Phalaenopsis is a miniature, warm to cool growing orchid which grows on trees. The plant has long, flat roots, a short stem carrying 1 to 2, oblong-elliptic, narrow hanging leaves. The plant blooms in spring on a stalked raceme, up to 10 cm long. The raceme has lanceshaped ovate-triangular, pointed floral bracts, about 3 mm long. The raceme carries 6 to 8 flowers. Flowers open widely, sepals and petals pale pink, lip and anther cap rose-purple. Flower-stalk and ovary are about 1.5 cm. Dorsal sepal is oblong, 8-9 × 4 mm, blunt. Lateral sepals are somewhat elliptic, about 9.5 × 4.5 mm, with blunt tip. Petals are obovate- spatulate, about 9 × 4 mm, rounded. Lip is 3-lobed, lateral lobes erect, subfusiform, about 5 × 1.5 mm, adaxially with a slightly thickened longitudinal ridge close to proximal margin. Mid-lobe is flat, spatulate, about 7 × 3 mm, base with a broad furcate-lobed appendage, tip rounded, spur about 3 mm. Column is about 5 mm, stout, broadly dilated at stigma, foot about 3 mm. Bandage-Like Phalaenopsis grows in the Himalayas, Assam India, Nepal, Bhutan, Sikkim, southern China and Myanamar at elevations of 1000-2500 m. Flowering: May-June. Identification credit: K.L. Chaudhary Photographed in West Khasi Hills, Meghalaya. & Pelling, Sikkim.